We’d love your help. 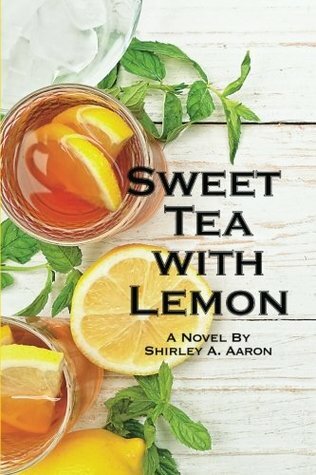 Let us know what’s wrong with this preview of Sweet Tea With Lemon by Shirley A. Aaron. Beulah recalls her friendship with Mavis and Edith, as they deal with the conflicts of family and daily life. The three women share adventures, humor, and tragedies. When Mavis is diagnosed with terminal cancer, the bond between them becomes stronger. To ask other readers questions about Sweet Tea With Lemon, please sign up. I really enjoyed reading Sweet Tea With Lemon. I found it hard to put down as I imagined I was a fly on the wall of these southern women. I read this book every chance I had while commuting to and from work, and throughout the day I was imagining about what was going to happen next. You will enjoy reading about how friendships can deepen when faced with tough times. I won this book on Goodreads. It was an engrossing and deeply emotional tale of several women in Alabama throughout their lives. Very real and heartfelt it kept my attention and drew me in. The atmosphere and conversations put me into their lives beautifully. It was a wonderful read. I really enjoyed the book could not put it down. I especially like the details of characters and relationships with each other. These women could be any one of us. They took the bitter with the sweet. Thanks Sirley A. Aaron can't wait to read another one of your books. I enjoyed reading this book. The characters were likable and the story was fun. It gave a clear pictures of what it would be to grow up in the south. Thank you to Shirley Aaron and Goodreads for this book. Such a sweet book. Full of heart and soul. Shirley is a graduate of Auburn University. She worked forty plus years as an educator. She retired as an Alabama English teacher in 1997. Then, she went to Georgia, where she retired as a media specialist in 2011. In 2014, She published a book of poetry, DROPS OF LIGHT and began writing TROUBLING THE ASHES, which is based on her life experiences in a small, rural town in Alabama, during the turbul Shirley is a graduate of Auburn University. She worked forty plus years as an educator. She retired as an Alabama English teacher in 1997. Then, she went to Georgia, where she retired as a media specialist in 2011. In 2014, She published a book of poetry, DROPS OF LIGHT and began writing TROUBLING THE ASHES, which is based on her life experiences in a small, rural town in Alabama, during the turbulent 60s and 70s, when desegregation of schools revealed anger, hate, and racism throughout Alabama. Since TTA was released, Shirley has written two more novels and is half-way through another one. SWEET TEA WITH LEMON will be released next spring, which deals with the friendship of three completely different women. One loses her battle with cancer, while the three friends learn the meaning of friendship, living, dying, and family.